There are two routes to reach the west coast of Shikoku, from Kochi. The most famous is to take route 56, a continuation of route 55, from Kochi all the way to Matsuyama. The other less travelled route is to cut across the island and take route 197 and reconnect to route 56. To reach Matsuyama in one day, you will probably have to cut across the southern cape, or else you would have to skip a lot of places. Travelling along route 197 is a very nice trip. This road cuts through the mountains allowing you to see very small villages along the way. There are a few places selling local fruits and food, but other than that, there isn’t much to see. When route 197 reaches 320, you will be in the town of Kihoku. 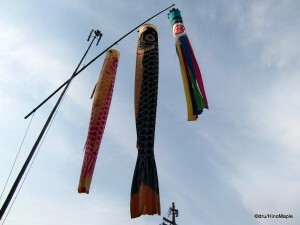 It is a town that is very easy to miss, but I was lucky to arrive during a small festival. There were typical festival foods, but only a little. It is a great way to see how small town Japan lives. It isn’t that special and easy to see in a few minutes. Route 320 is also the same, cutting through the mountains until you reach Uwajima. 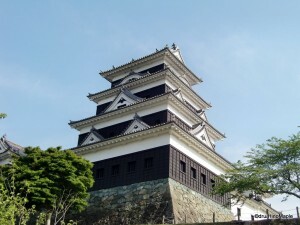 Uwajima is a small city that, like most cities in Shikoku, has its own castle. It is also slightly infamous for its own temple devoted to the phallus. I didn’t spend any time in this city, so unfortunately, I’m not sure if there is anything of interest here. Ozu is a very small city that normally has nothing of interest. The downtown area closes very early, and there are very few shops left. It is a victim of big box shops coming in and strangling the mom and pop businesses. Driving down the main shopping street feels like a ghost town. Shutters are closed and very few people are around. While this is true, the town itself is very beautiful. 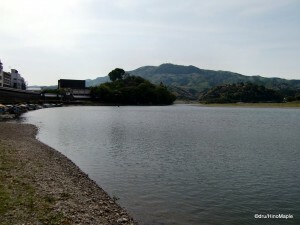 If you are looking for something to do from Matsuyama, Ozu is a great place for a day trip. However, heading to Uchiko, or Uwajima is probably easier. Even the hotel staff in Ozu can’t really speak English, however they are still helpful. Ozu has a few things of interest, and almost all of them are easy to reach on foot. The first thing to see is the river. There is a pedestrian walkway along the river. There are usually a bunch of families and students out on the water enjoying themselves on the weekends. The river walk will take you to the back entrance of Ozu-jo. As I said, Shikoku has many castles. This castle is even smaller than Kochi, but the castle grounds are wonderful. You can see the biggest water well in Japan, or so they say, and some huge trees next to the castle. There is a beautiful garden and a nice grassy area to relax on. All of this is free, however, entrance into the castle itself isn’t. If you are backpacking, there is a youth hostel behind the castle that looked very nice. I would have stayed here, but I didn’t know it existed. Route 56 cuts through the middle of Ozu. The castle is located on one side, and the old town is located on the other. The old town has many activities that any other small Japanese town has. It is also an area where you can see the old style of Japanese homes. This is very similar to Naramachi in Nara, but not as grand. They also have a large red brick building, but unfortunately, when I arrived, it was after 5pm and everything was closed. From anywhere in Ozu, you can see Mount Tomisu. 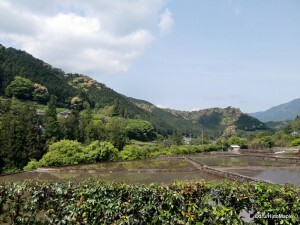 It is a small mountain that overlooks the town. It is very beautiful as there is a large garden at the top. It was highly recommended to me by the hotel staff, but you do have to drive there. Ozu is not a friendly place if you don’t have a great map, or navigation. It’s easy to get turned around and lost. However, I would definitely recommend visiting this city, as almost any other city I have been to in Shikoku. This entry was posted in Automobiles, Shikoku and tagged big box shop, cape, Ehime, Ehime-ken, festival, ghost town, hostel, Kihoku, Kihokumachi, Kochi, Kochi-ken, Kochi-shi, Matsuyama, Mount Tomisu, Mt. Tomisu, nara, naramachi, Ozu, Ozu castle, Ozu Hostel, Ozu Youth Hostel, Ozu-jo, Ozu-shi, phallus, red brick building, route 197, route 320, route 56, Shikoku, shopping street, shutter, temple, Tomisusan, Uchiko, Uwajima, Uwajima-shi, Youth Hostel, 内子, 四国, 大洲, 宇和島, 愛媛, 日本, 松山, 英会話, 英語, 高知 by Dru. Bookmark the permalink.